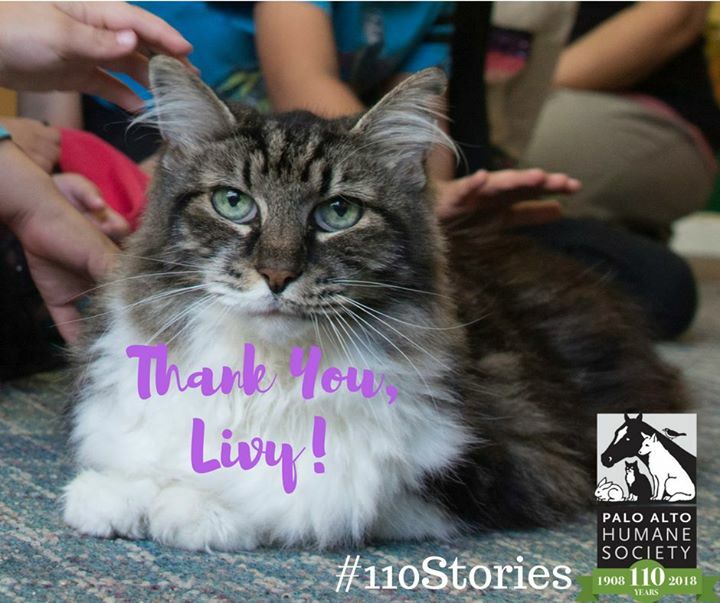 Today, for our #110Stories, we’d like to tell you about Livy. This beautiful cat is now 18 years old and was PAHS’ favorite “classroom cat.” After he gave five years of service in many of PAHS’ educational sessions that included Critter Club, Animals Everywhere, and visits to senior centers and other community venues, his person, Reine, felt it was time for Livy to bid adieu. Students at Palo Alto Friends’ Nursery School celebrated Livy with a retirement party on November 9, 2016. Cats like Livy are important ambassadors in our message of humane treatment of animals. Thank you, Livy, for your patience, companionship, and contributions to PAHS!